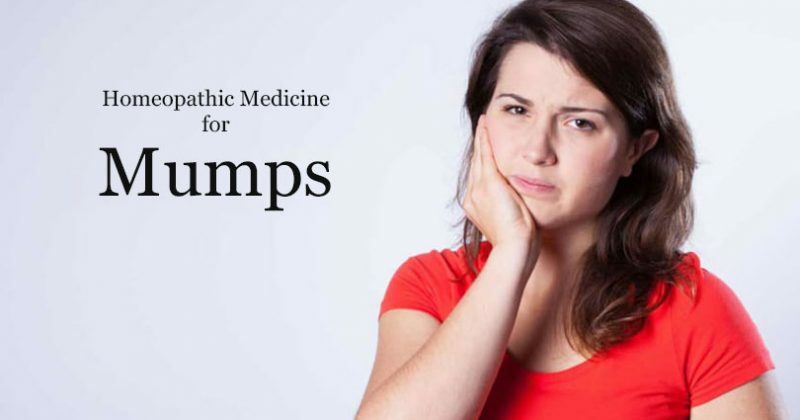 In this post, I shall discuss the homeopathic medicine for mumps or top mumps treatment homeopathy. Mumps is a viral infection that affects the parotid gland caused by the mumps virus. The parotid gland is a saliva producing (salivary) glands which are situated below and in front of the ears. When a person gets infected from the mumps virus, it affects the parotid glands in which either one or both the parotid glands may get swollen. Homeopathic medicine for mumps is very useful in viral infections like mumps. In Hindi or Urdu, we call it Kan Pairay. Some patients infected with mumps virus do not show any symptoms and at times, mild ones. Fever. The patient complains of not feeling well and develop a fever. The Mumps virus causes this condition. It is also a contagious disease that can spread instantly from the infected person to others for example, infected saliva. In addition, contact like inhaling respiratory droplets infected with the mumps virus and through saliva can also infect you. Homeopathic mode of treatment boosts the disease fighting mechanism of the body and encourages it to fight the mumps infection. Effective homeopathic remedies for mumps are Belladonna, Merc Sol, Pulsatilla, Apis Mellifica, Chamomilla and Lachesis. Homeopathic medicine Trifolium Repens is used as prevention for mumps. Belladonna is the best medicine for mumps when associated with fever. In these cases, the patient experiences the swelling of the parotid glands and marked pain. Generally, the pain is stitching or shooting in nature. At times, the pain from parotid gland extends to the throat. The face of the patient appears red and flushed with heat and the temperature of the body also rises. Dryness of the throat and throbbing headache are other symptoms. Homeopathic medicine Merc Sol is highly effective for mumps. It is prescribed for mumps when the parotid gland on the right side is inflamed. Symptoms are inflamed, highly painful and swollen parotid gland. There can also be swelling and a rise in the temperature on the right side of the face of the patient. The pain in the parotid gland becomes worse on swallowing. The patient can also suffer from a shooting pain in the right ear with these symptoms. Offensive odour from the mouth and increase in saliva are other symptoms. Lachesis is another very useful homeopathic medicine for mumps. It acts well in treating the left sided parotid gland inflammation in mumps. In such cases, the left side of the face is highly sensitive to touch that makes the pain worse. The area around the left cheek and ear is red and hot to touch. The pain becomes worse on swallowing, especially warm liquids. Lachesis is one of the best listed homeopathic remedies for Septic Parotiditis. Chamomilla, Pulsatilla, and Apis Mellifica are other useful homeopathic remedies for mumps. Homeopathic remedy Chamomilla is prescribed for inflammatory swelling of the parotid gland when associated with intense unbearable pain, restlessness and irritability. Apis Mellifica is beneficial in cases where metastasis of mumps infection to the brain appear. Another homeopathic medicine for mumps is Pulsatilla. It is prescribed when metastasis of mumps infection to ovaries, mammae or testes has occurred.